Here is a snapshot from a recent Old Navy email. Personalization is not new. Brands have been using it for years. It’s common to make sure you use the subscriber’s first name in the opening of the email, but brands that rely heavily on images in their email have always had to find more unique ways to make emails more personal. 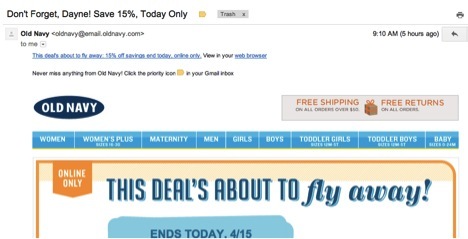 Old Navy went ahead and included the first name in the subject line. They also want to make sure I add them as a priority in my Gmail inbox. As software capabilities improve, brands will get even more personalized. It isn’t just about names. It’s about specific items consumers want to purchase. Maybe preference centers will finally take off because subscribers won’t have to list preferences. Companies will be able to figure it out. Photography is something consumers demand. Think of the technology that has taken off in the last year: Instagram and Pinterest. People love beautiful photography. It’s not enough anymore for brands to use basic photography. Consumers want to see what apparel looks like on someone like them. They want to see the product being used and they want to see other amazing photography. 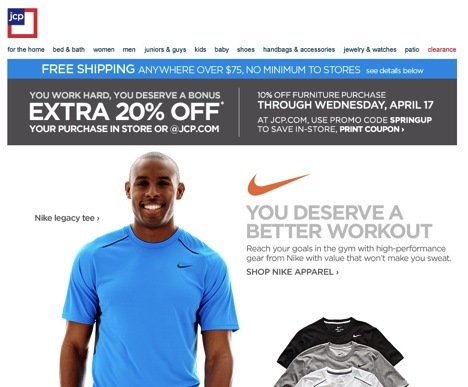 JCP has been getting ripped on lately, but this last email stood out in my inbox. It’s always good to pay attention to Amazon when it comes to any type of online marketing strategy. 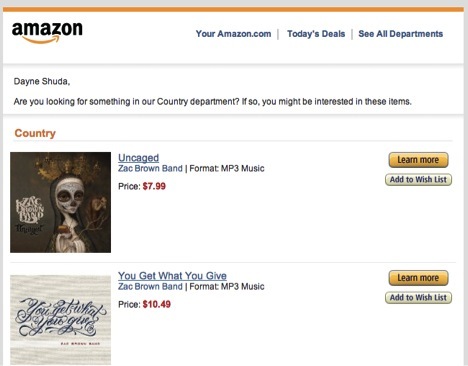 Amazon has a great email marketing program. They are the best when it comes to personalization and really specific email. 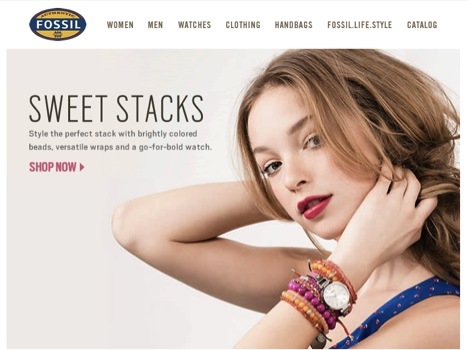 Here is an example of something a little different from the biggest online retailer. It’s an extremely minimalist design. They’ve taken away all the elements and put focus solely on the product. I’m a big fan of minimalist design so maybe I noticed this more than most, but it’s something I’ve seen in a few places. It’s really hard to minimize focus in online marketing. We want to give consumers everything they could possibly want. We want to think of every possible objection someone might have and then provide an option or an answer. What seems to happen when we give too many options or too many elements is that it confuses the consumer. In email, the result is the person can’t decide and they just delete the message. That’s why I really like what Fossil did with this email. There is a single focus. It’s on this new style of watch and you really only have one place to click to find out more information. More companies are using things like blogs to grow their business. 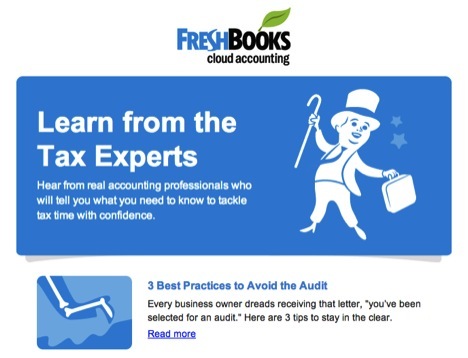 The example above is from FreshBooks. The company wants to provide additional value to their subscribers so they put together some great resources on their blog and promote the content to their email subscribers. There is no selling going on in this email message. It’s all about providing more value to the subscriber, which makes the company’s service even more appealing (and worth more than the competition). What other trends are you noticing in email this year? Share your observations in the comments. Dayne Shuda is a contributing blogger for Fluttermail. He writes about the latest trends in email marketing on the Fluttermail blog. Fluttermail is an email provider for small businesses.